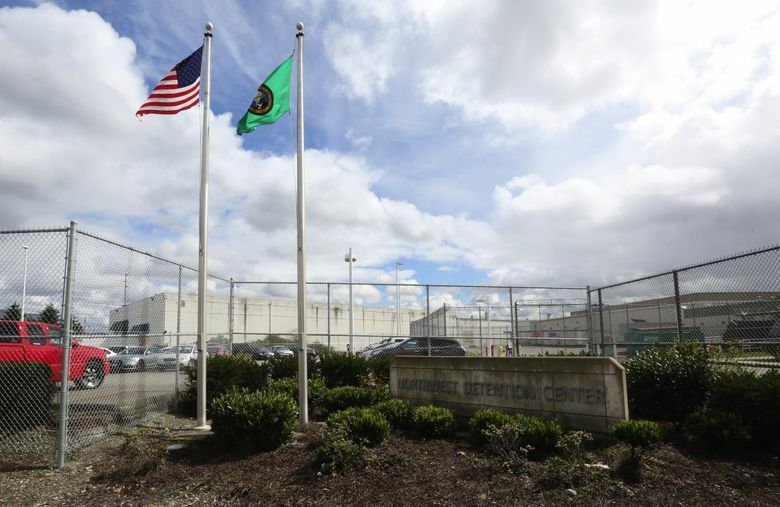 Washington state can pursue its lawsuit seeking to force one of the nation’s largest privately run immigration detention centers to pay minimum wage for work done by detainees, a federal judge in Tacoma ruled Wednesday. U.S. District Judge Robert Bryan denied the GEO Group’s motion to dismiss the case. The for-profit company runs the Northwest Detention Center, a 1,575-bed facility in Tacoma where detainees are held pending deportation proceedings. In a related case, Bryan also declined to dismiss a complaint by a former detainee named Chao Chen, who seeks class-action status — and back pay — on behalf of all Northwest Detention Center detainees who have performed work in the past three years. GEO pays detainees $1 per day to volunteer for tasks such as janitorial or kitchen work. Washington’s minimum wage is $11 per hour. The state wants GEO to give up the profits it has made by relying on detainee labor over the past decade — potentially millions of dollars. The judge said GEO failed to show that Washington state’s minimum wage law, to the extent it applies to detainees, is overridden by federal law prohibiting the employment of people who entered the county illegally. That law says it’s up to the federal government, not the states, to impose sanctions on those who hire people who entered the country illegally. However, Bryan ruled, requiring GEO to pay minimum wage — and subjecting it to penalties if it fails to — do not amount to such prohibited sanctions. “Even if, as Defendant argues, the provisions of the Washington Minimum Wage Act are construed as ‘sanctions,’ they would not be imposed on account of employers hiring unauthorized aliens, but rather because of the failure to pay the prevailing minimum wage,” he wrote. However, the judge also said it was too soon to resolve some of GEO’s other arguments. Among them is that Washington’s minimum wage law is pre-empted for another reason: that it would hurt federal interests by increasing costs to U.S. Immigration and Customs Enforcement, for whom GEO runs the detention center, and require the company to abide by a patchwork of state minimum wage laws. GEO had also argued that the state doesn’t have authority to bring the lawsuit. Bryan rejected that, saying Washington’s interest in the well-being of its residents gave it such authority. The company also asserted that it does not have to pay minimum wage because the detainees aren’t required to work. But the judge said it was premature for him to determine if that was truly the case, considering that the detainees are in custody, paid just $1 per day, and helping to enrich a private corporation. During oral arguments last month, the Washington Attorney General’s Office said it is entitled to enforce the minimum wage law against GEO just as it’s entitled to enforce it against any other company in Washington. While the state has determined that its own prisons don’t have to pay inmates minimum wage, it’s made no such determinations about private detention centers, said assistant attorney general Marsha Chien. Having the detainees perform that work so cheaply fills jobs that would otherwise go to local residents, Chien said. While keeping labor costs down at a state prison benefits taxpayers, keeping them down at the private detention center benefits only GEO, she said.